This is not going to be an in-depth review, but this is the best read I've had in years! 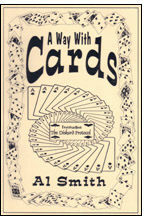 Al Smith's Diskard Protocol is a revolutionary maths-based card principle. As Al says himself, the original concept is as old as the hills, but Al has found & devised revolutionary new ideas, handlings, concepts and routines. Intrigued? Well, the only clue is the 22nd card from top. When I got my copy, I could not put it down. In fact, I missed a business meeting because I was too engrossed in the book. It is so good. If you like maths-based card magic (Free Cut Principles, Automatic Placements, Deal & Ducks, Reverse Faros etc., etc) you are guaranteed to love this book. My advice is this: Get a copy now!